It never fails; you’ve finished cutting the cake and tossing the bouquet – “weird, why were my bridesmaids the only ones out on the floor?” You and your new spouse have just wrapped up your first dance and as you look around in preparation to dance the night away with all of your guests, you see it: the caterer is starting to pack things up and you can hear the faint whistle of a vacuum down the hall. “Wait!! It’s not over! Who said the party was over?! I don’t have bored guests! I didn’t give anyone permission to leave!” Now the only remnants of your guests ready to shake the night away are your ever-faithful bridal party and your no longer sober cousin Vinny. Even your mom has gone shoeless and is taking gifts out to the car. Party. Is. Over. Remember that 30 minute impromptu photo session in front of the fountain? The pics that your photog said you would “just regret not getting”? They were the culprit. While your guests were standing in line waiting for you to get your album completed, they ate their cake and had no want to stick around any longer just to watch you pose for what is sure to be the cover of the next bridal magazine. In short: you bored them into leaving. And now your party is no more. I know, the thought of your man seeing you in your dress prior to the big day is frightfully saddening, but hear us out. Pictures are critical, right? You want all of the shots, the light just right, the elements, the ambiance, the hair. . . we’re veering off course. Ok. You want all of the pictures that you dreamed of but we can almost guarantee you one thing: you will not have time for it all on your wedding day. You will have mothers to deal with and guests and caterers and lines of people. . . and contrary to popular belief, the only person who loves watching you get your picture taken is, well, nobody. Our tip? Pony up that tux rental fee twice and schedule a wedding pre-shoot. Get all of the bridal and “groomal” pics that you want taken then. Hit up your reception site and see if there is another day that you can take pictures at their facility – you are renting out the place and you’d be surprised how many venues will accommodate having their venue. . . I mean your beautiful face. . . photographed by a professional. Get the formal shots of you and your fiancé out of the way so that on your wedding day, your photographer can focus on family shots and photos of you and your guests. This will cut your photography time way down on your big day and keep you from alienating your guests. Plus, who doesn’t want to get dressed up for a photoshoot twice? Grooms. . . quiet. No, no. We passed English. We aren’t talking about eating the cake. We are talking about cutting said cake and doing it early. . . Eight o’clock is usually kids bedtime so we thought this would convey an early hour to. . . oh man, this is getting complicated. Please just keep reading. A lot of brides will wait until the end of the night to cut their cake and do all of the other ceremonial wedding stuff (bouquet toss, garter, first dance), you know, once the guests are all ready to go home??? Yeah, doesn’t make sense to us either. Find your turning point in the night – the transition from dinner to reception or the transition from greeting line to dancing and pack that time with all of your traditional wedding items. Follow the natural flow of the night by sliding these events between different events but do them early enough that your guests don’t bail out beforehand. After all, what good is a cake smash if nobody is there to see it? Keep your guests engaged in the night by breaking up the monotony with these guest-involving events and you’ll be pleased with your turnout at the end of the night. 90s musical reference? Of course. We are in the music business. But on this point, we couldn’t be more serious. If you’re like most brides, you are hoping to pretend to not be bossy and be casual and chic and relaxed on the day of your wedding even though you secretly want to go all drill-sergeant on your guests and make sure to keep things moving. Well, your DJ/Emcee is your ticket, my friend. If you hire the right Emcee for your event, they can keep things moving for you; they will turn the music up at the appropriate times and let people know where to direct their attention throughout the night. If your plan was to cut the cake at 8:00 (we’re clearly not letting that go), your DJ can cut your ever-enjoyable conversation with your dad’s cousin off by making an announcement that “it’s time for ______”. 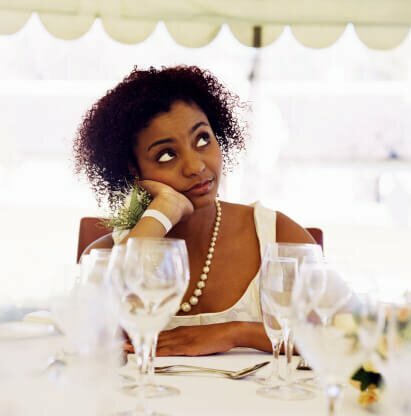 Not that you weren’t enjoying reminiscing about her dog. . . .
Keeping your guests engaged at your wedding celebration isn’t rocket science but you do need to have a plan. Let the professionals at Opus Productions help you keep your party going and make your wedding a night to remember. For more information on our services or to book a DJ, contact us at 801.866.5122 or find us online at www.djopus.com.